Now I have to be very honest I never really got into this, but a lot of my school mates loved it. They are probably rich architects now, maybe I should have played it more. The Meccano was the man’s version of Leggo, as Meccano was made totally of metal, and you would make the models by really screwing them together. Meccano was made way back in 1901 by Frank Holby, and it was almost possible to make anything from the kits if you could buy enough. The whole idea of Meccano was to inspire mostly boys to learn how to build things, and to problem solve as they tried to do this. It was also possible to build full sized models too, like a locomotion. Yes that was actually done. In the 1970s Meccano added electrics to the products, so not only could we make the spaceship, but we could add flashing lights and moving parts too. Wonderful. In 1972 Airfix purchased the company, and continued the Meccano brand with sets like Army Multikit. But the popularity of Meccano was diminishing, and in the late 1970s Airfix stopped producing the Meccano sets, although a factory in France continues at a low level. 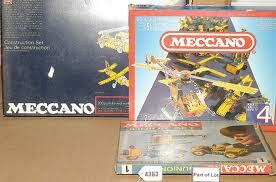 The loss of Meccano is, looking back on it, a big shame. As if you were clever enough and patient enough you could build working models of so many things, and that learning curve would have really inspired thousands of people to take a career along those lines. Were you one of those guys or gals that did that?